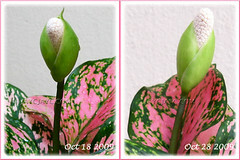 About 13 months ago, we received a 4-inch tiny pot of the most beautiful pink Thai Aglaonema we’ve ever seen! This wonderful gift came sweetened with a box of mouth-watering cheese cake too from Cheah of No-Frills Recipes in Ipoh in appreciation of blogging help/tips rendered by me. Not that I wasn’t extremely delighted and thankful for her thoughtful gesture but felt a little awkward as sharing my knowledge is something that I love doing and expect no reward whatsoever! Well, I too stand guilty oftentimes of showing my gratitude in kind…hehe, we’re just being our natural selves as loving creatures, right? Could this fabulous pink-leaved cultivar of Aglaonema be ‘Easter Parade’ as indicated previously at Asiatica Nursery’s site, which is now non-existent. Recent googling for this beauty’s ID led us to believe that it is one of the Thai Aglaonema hybrids, having the cultivar name ‘Valentine’. Well, for the time being, we’ll let the name remain unless someone wise us up. Aglaonema cv. ‘Valentine’ has an erect and compact growth when young which gradually becomes more outwardly spreading with a green creeping stem (illustrated in right image below) as the plant develops. 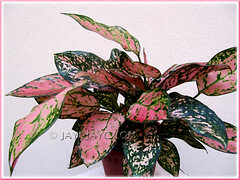 A slow-growing Aglaonema cultivar with foliage variegation that is simply irresistibly attractive! Leaves are painted in appealing tones of rose-pink and randomly splashed with dark green blotches, creating such diversity in its pattern. The midrib is dark green in colour, so also are the leaf’s margin and petiole. Our gorgeous plant which has been growing steadily for 13 months at our courtyard has leaves that are ovate to broadly-ovate in shape, approx. 9-16 cm long and 5-9 cm wide, with long petioles between 7-13 cm. Currently, it’s about 24 cm tall and almost 60 cm across. 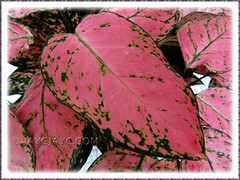 Leaf variegation depends greatly on the intensity of light received on the leaves, causing the hidden leaves to be more dark green while the ones exposed to light having a deeper pink background. It thrives well with bright light, warm (not hot) temperatures, high humidity and sufficient water in an organic-enriched potting medium. Origin: The new colourful Aglaonema hybrids, hybridized actively in Thailand and Indonesia over the last decade or so are presumed to have Aglaonema rotundum in their parentage. On the other hand, the green-variegated Aglaonema of yesteryears, popularly cultivated worldwide are native to the tropical swamps and rainforests of Southeast Asia, from Bangladesh east to the Philippines and north to Southern China. 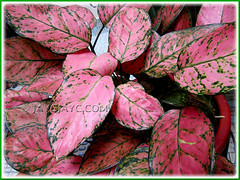 Features: Aglaonema is a genus of about 50 or more species, mostly found in the wild. These long-lasting plants are mainly grown for their beautiful and attractive foliage. Typically, Aglaonema consists of soft-caned herbaceous perennial plants reaching between 30-150 cm in height (mostly below 90 cm). Leaves are evergreen, ranging from 10-45 cm in length and 4-16 cm in width. Those colourful varieties popularly sold in the marketplace and nurseries nowadays are actually commercially cultivated hybrids. 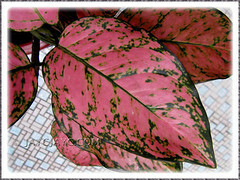 Eversince Aglaonema has been extensively hybridized in South-east Asia, especially in Thailand and Indonesia over the last few decades, numerous hybrids and varieties have surfaced and are highly variable in appearance, form and colour. These newer Aglaonema hybrids with an explosion of leaf colouration and venation are popularly sought now that prices have dropped drastically, making it so affordable for any interested grower. Though the new hybrids still have varieties with familiar foliar shades of green, white and silver, it’s the vivid reds, pinks, oranges and yellows with their amazing colour combination that steal the show! Truly spectacular, colours somewhat like the foliage of the Crotons and Caladiums! 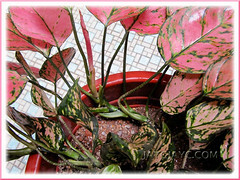 Enjoy and be mesmerized with the breathtaking photo gallery of Thai/Indonesian Aglaonema hybrids @ Florasylum of Flickr.com. As remarkable as the leaf variegation is its shape that comes in variable sizes, forms and pattern. Depending on the hybrid, it can be broadly ovate or lanceolate to narrowly ovate, or even oblong and elongated, some with a slight twist or undulated. Some hybrids even have coloured petioles, different from the usual green. Most of these newer Aglaonema hybrids have compact and erect growth, though some like the cultivar ‘Valentine’ have the tendency to fall over instead of growing upright. They can be slow to moderate-growing and may produce inflorescence that is similar to those of the aroid family, comprising of a spathe and a spadix. The Aglaonema flowers are relatively small and inconspicuous, with a light green spathe and a white spadix. 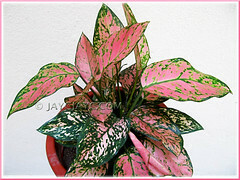 Culture (Care): Aglaonema is easy-growing and needs minimum care. Given its native habitat in the tropical swamps and rainforests, just remember its basic requirements of sufficient light, warmth, high humidity and moisture. Light: Bright light or filtered sunlight but never under direct sun. Unlike the old-fashioned green-variegated varieties that can tolerate low light or shade, the Thai/Indonesian Aglaonema hybrids require bright light or indirect sunlight and warm day temperatures, not hot and dry though, for optimum growth and brilliant leaf variegation. Moisture: Require adequate water regularly but allow soil to dry slightly between watering. It needs high humidity. Mist often to raise humidity if necessary. Soil: Any enriched and moderately well-draining potting mix. Others: Feed once monthly with a liquid fertilizer for foliage plants. 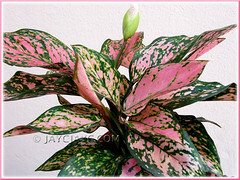 Repot once in every two years as Aglaonema are generally slow-growing. Spider mites can be a problem, especially on the underside of leaves, as well as between petioles and stem, retarding leaf growth and shape. Be vigilant and treat it early. Be aware that Aglaonema or Chinese Evergreen is known to have poisonous sap that may cause skin irritation and if taken orally causes irritation in the mouth too. For sub-tropical and temperate zones: Aglaonemas are sensitive to cold temperatures and do not like cold drafts. Hence, to prevent damage, they should not be exposed to temperatures below 50°F. Water sparingly in winter but do not allow plant to dry completely. For optimum growth, maintain soil and air temperatures between 70-85°F, the warmer the better. Propagation: By vegetative propagation, that is, by dividing the offsets or from herbaceous stem cuttings that root easily in soil or in a glass of water. 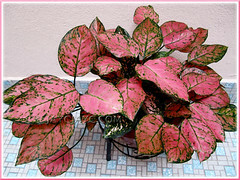 Usage: Thai and Indonesian Aglaonema hybrids make excellent houseplants or indoor potted accents for interiorscape settings in homes, offices or shopping malls. Outdoors, plant in garden beds amongst greens or below large trees as groundcover to add colour, beauty and interest or as container plants under covered porch or decks. 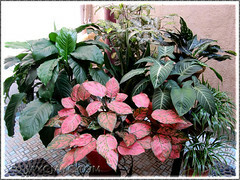 Grow them to purify or cleanse the air indoors as Aglaonema has been listed as an air-cleansing plant. These are truly wonderful to have in a garden where the red coloured leaves brightens the dull spots in the garden. I have been cultivating coloured plants and find that these are the best to have when it comes to low maintenance. I wonder whether they become leggy & eventually die after few years becoming matured. I once saw a little potted plant sold for RM25.00. I thought that was a way too expensive for a five leaved plant. what a lovely looking plant! Thanks for all the information, I would love to find one of those! Wow, so beautiful, nice vibrant colours too! But it certainly takes a long time to grow. Has it been 13 months already? Can’t really remember!! James – I think the newer hybrids were created to be more compact and hardy, probably may not be leggy too. As a benchmark, we’ve no reason to remove a single leaf from our 13-month old plant so far. Keeping our fingers crossed though that it will continue to flourish and remain youthful for many more years ahead. Gillian – Thanks. Hope you get soon what you desire. Buenos dias yp vivo en peru me dedico a la siembra de plantas ornamentales quisiera saber donde podria comprar esta variedad. Sorry, Cindy… we don’t know where you could buy this variety. We’re just home gardeners and not a retail garden nursery.